Sharing crafts, quilts, and back to the land projects. Young David and I have returned to Canada. I have been doing some sewing but it is mostly just some clothing repairs and slogging away on quilts that I have already posted about and I am trying to finish up before I start something new. I have been meaning to post some of my favorite photos from our holiday trip, which was an amazing five weeks of rest. I feel like a whole new person after taking a vacation and spending quality time with my family! We went on a day trip to the town where my parents met in North Carolina. It was so great to be with my sister who I love so much and don't get to see enough of!! She is even into doing yoga and has become a vegetarian! I am glad because it makes me seem like less of a radical! I got her to take some pictures of me and I twisted her arm into taking selfies with us. I still wish I had taken more photos now that we are so far apart once again. Sweet David was such a good sport, we drove around with him for hours. We walked down to the falls, they were really flowing! The trail allows you to go into the mist behind the falls and look through them. It was incredible. I can't believe it but I just keep loving this kid more every day!! The town and falls are in the beautiful Blue Ridge Mountains. These hills are over a billion years old, and they really do glow with a blue haze that is mesmerizing. We stopped to admire the view as we left North Carolina. David went to the Atlanta Zoo, and the Georgia Aquarium, to family reunions and special trips to meet relatives, spent time at the playground, went to the movies, ate lots of french fries, got lots of great toys, new clothes, and got to spend some real quality time with his grandparents, who spoiled us both the whole time we were there. A highlight for David was meeting his favorite characters. I didn't even put him up to this but he saluted when posing with the army man. Little ham! My brother taught me how to be an adult at Disney World: you have an alcoholic beverage at every city in Epcot. While I didn't participate I did get a vicarious thrill from watching him drink his way around the world with a Guinness in Britain, a margarita in Mexico, warm sake in Japan, wine in Italy, beer in Germany, and my favorite - "a tipsy duck in love" which is a combination of iced coffee, tea, chocolate, Jim Beam Whiskey, topped with whipped cream (I definitely drank some of that one!) Huge thanks to my brother who is a great uncle and also treated us to lots of goodies!! I am so, so, deeply thankful to my parents for allowing me to completely veg out at their house and recharge over the holidays. It was such a good experience for all of us! My last photo is of David on the BC ferry, enjoying his last hurrah of french fries (there is no restaurant where we live) as we headed home. Thanks again Mom and Dad, we miss you already. Greetings! I have been in Georgia spending Christmas with my parents and I finally got all my electronics worked out so I can upload some photos. Please forgive me for the poor quality of these pictures, they were all taken with my iPod. I saw a pattern online and I could not help myself. The great thing about these knit beards is that they actually keep your face REALLY warm! I figure they would be great for boating or bike riding in the winter. Of course I made some hats for the Craft Fair and forgot to take any pictures. I had someone snap a photo of this one on it's new owner. I made a woolly hat for David before we left and he complained that it was "too itchy! Make it fuzzier!" So this one is made out of really soft and silky wool that comes down over his ears to keep them warm. I finished it while we were sitting on a plane on the way here. Another hat I just finished is modeled after a viking helmet. Also good for boating, and charging into battle. The brim folds up and there is a neck guard in the back. Grrr!! Go forth and conquer!! 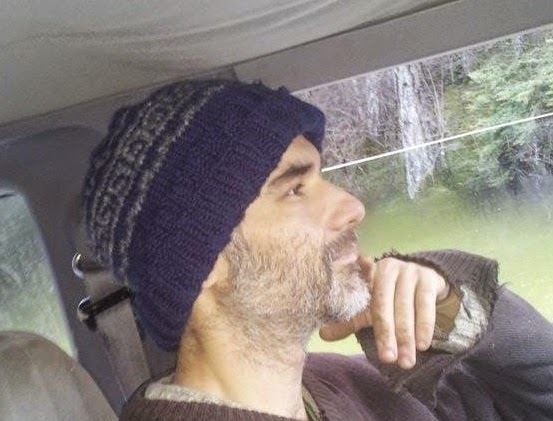 This helmet pattern is available on Ravelry.com and was written by Debra Belletete. It also includes instructions for making horns that attach to the hat. A pity my photos are not better so you can see the detail of the cabling around the crown. I found several really beautiful patterns while I was looking for Viking, Aran, and Celtic knits. Everything from braided blankets to lacy cowls to this sweater with a dragon made from an i-cord. Now all I have to do is combine the helmet and beard and then I will be ready to chop my firewood in style and possibly scare small children. Blessings to everyone in blog world, I hope you all had a fabulous holiday and may the new year bring you rejuvenation and joy! 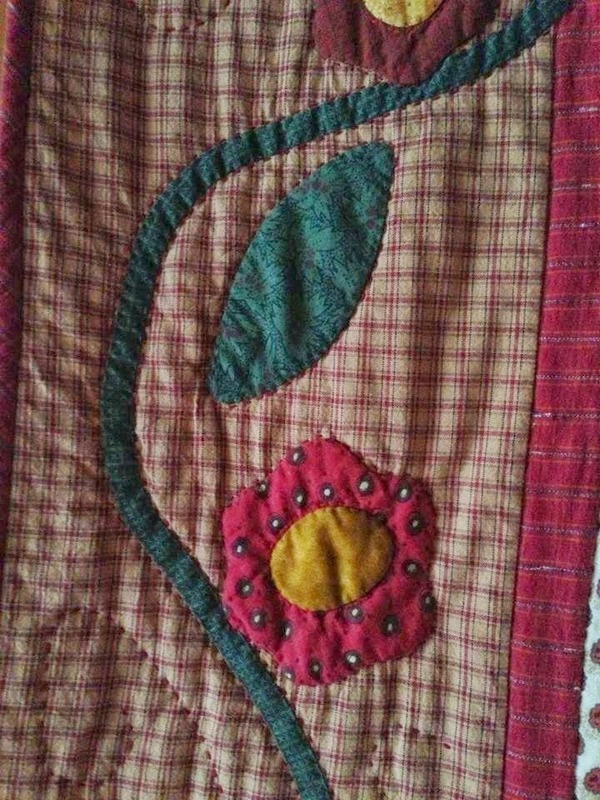 The amusing part is that this quilt was not actually completed only because of a small square foot in the corner that still had a few safety pins in it and hadn't been quilted. I ran into a bobbin problem, gave up on using my FMQ foot, and went ahead and hand sewed the binding on before I finished that last little bit of quilting. This quilt was like that for ages and I finally whipped it into the machine and finished it in about 3 minutes! Instant gratification! I really love this quilt and I drafted the pattern from a quilt trick I saw online where the hexagons were cut in half and sewn in strips to avoid an encounter with the Y seams. This quilt was made with some scraps and a few dressy shirts, so I could test out my pattern before I cut into some nicer stuff for a lap-sized quilt. I have to give a huge and heart felt thank you to the online quilting community because I am finally at the point where I feel like I can make up my own patterns. I didn't know anything about quilting when I started and I have learned SO much from fellow quilt bloggers and their projects and tutorials. Learning about quilting as I go has been really fun. Whoever said to "quilt all of your own quilts" was spot-on. (I think it was Christa Quilts). That way all of my quilting skills are improving together, and also I love the character that each quilt has when it is finished. If someone else had quilted them, they just wouldn't be the same. I am still turning out Frankenstein corners! Not perfect yet. And now I'll leave you with a few pictures of an expertly made quilt, made by my Aunt, Susie Dumas. Isn't that a gorgeous country quilt? I am in awe at all of those tiny squares. As long as I can remember, every time I visited Susie's house she was working on a quilt and had several beauties on the wall. I remember her showing me the callouses on her fingers from quilting. She is not a blogger so I hope she lets me show off some more of her work when I visit for the holidays. I love that quilting is in my family and I am so proud of my Aunt Susie who has been published and won awards for her quilts. Have a fabulous day and thank you for reading! I am working away on my denim nine-patch quilt. I LOVE this quilt. It is super thick and heavy and WARM!! I have been hand quilting it so I get to cuddle under it while I work. The denim is surprisingly not that hard to quilt through. One of the reasons why this quilt is so cozy and warm is the backing, a solid piece of fleece. The weight of the heavy fabrics used in the top combined with the fuzzy fleece backing make for a lovely warm blanket, just in time for some rain and colder weather. I realized that because my favorite part of making a quilt is usually hand sewing the binding, maybe I just love to sew by hand? Yes, I do! However I am still getting the hang of making straight and even stitches. I am using thick thread in a light brown, hoping that my stitches will show up. I figure if I am going to take the time to hand quilt, I want those stitches to be obvious. Right now I am quilting around the nine patch blocks and around the border, until I decide how to further quilt it. Am I breaking the rules of quilting by using my quilts before they are done? I may or may not have slept under this one already. Hah! I've also been making some little dolls, and plan to make some clothes for them. The first one I made was played with right away and obviously needed some decoration. David went at it with a permanent marker and came and showed it to me. "Mom, look! This is zebra stripe man." I have lots of beautiful fabric to play with and I have been looking through some of my stash, dreaming about what to do with it. This one is going to be fun! Thanks to my friend Carli at Good Earth Quilting. As promised I am sharing my recipe for homemade Macaroni and Cheese, one of my favorite comfort foods. Of course, you can use any kind of noodles (like rice or other gluten free alternatives) and my favorite are those big shell noodles, because they hold a lot of the delicious cheesey sauce! My southern Great Aunt Shirley used to make her signature shells and cheese at every Thanksgiving and Christmas. Prepare noodles al dente, drain and set aside. In a separate saucepan, melt 4 Tbsp of butter over medium heat. Add green onions and saute until just soft. Blend in flour and dry mustard. Whisk until well blended. Gradually add milk, 1/2 cup at a time, whisking until smooth after each addition. Continue to stir as the mixture bubbles and thickens. Remove from heat and add cheeses, stirring with a wooden spoon until the cheese melts and blends with the sauce. Add salt and pepper. Add sauce to macaroni and stir until the pasta is evenly coated. Spoon into a casserole dish. Melt the remaining butter and toss with the breadcrumbs and parsley, then sprinkle this mixture on top of the casserole. Bake 15-20 minutes at 350F. So good! Just like Great Aunt Shirley used to make. 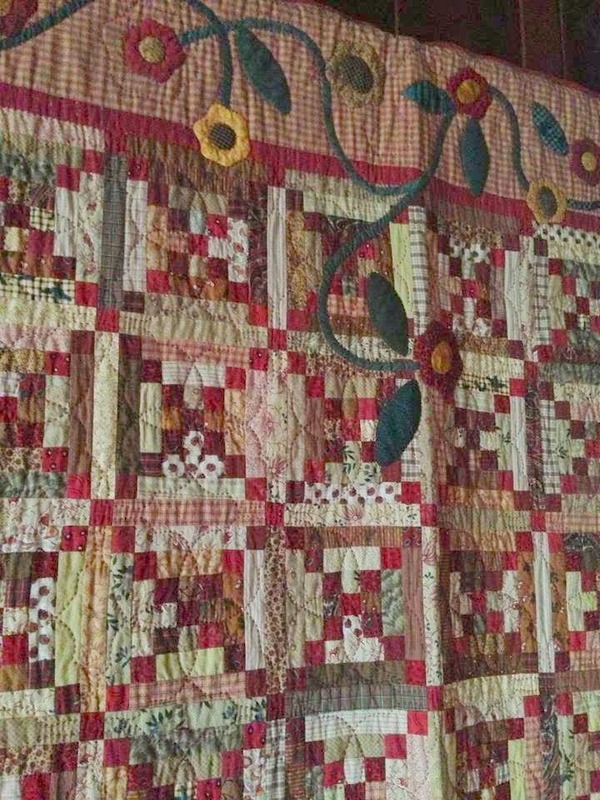 Why do quilting and blogging go together? Because there is a story behind every quilt. Putting together a quilt is a mammoth craft endeavor, takes a long time, and a lot of effort. Often quilts are made for special people in our lives and the work that goes into them reflects our feelings. 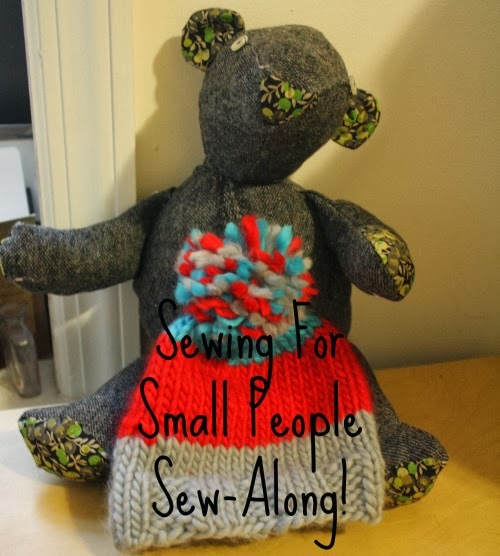 Whatever is going on in my life gets put into my sewing, and I can look at all kinds of things I've made and remember what I was going through when I sat down and did all those stitches, sewed all those pieces together, or stayed up late quilting. My latest quilt reflects the place my mind was at when I was creating it. It was one of those projects I made in a hurry and just wanted to finish, and it turned out rather crude and sloppy. How fitting that the word I chose to embroider on the back is "Forgiveness". We are all only human and make mistakes and have regrets, and all we can do is carry on and forgive ourselves, and forgive other people. I am still learning about quilting as I go and I did learn some things on this quilt. While wool is warm and can be an amazing material, if the top of a quilt is too scratchy it will be uncomfortable on your bare arms as they lay on the top of the blanket while you are underneath it! Also, I played around with using a greater seam allowance to compensate for the thickness of some of the wool pieces, and that added to the chaos. I was still using my 1/4" sewing foot and I should have marked the 1/2" line on my machine with masking tape. Firefly snuck her head into the greenhouse for a snack while I was out photographing the quilt! It is raining cats and dogs out there today. I didn't have the energy to really quilt this thing, I only sewed along the major seam ditches and called it done. Ultimately this particular quilt is only practical and not so much a thing of beauty! But it will keep somebody warm... even if that somebody turns out to be the dog! Haha! Thankfully I have other quilts I am working on that I am really stoked about, and that I think will turn out to be well crafted and beautiful. I picked up the Sister's Ten Block of the Month pattern again and I have six more blocks to make (three more block patterns, two of each) before I am ready to cut out the sashing and other bits, and put it all together! I'm really excited about this quilt, and because the background is cream colored, I am going to put it somewhere where it can be admired instead of used. It will be the first quilt I have made for this purpose. All of the other quilts so far have been made to be well-loved and slept under, and are thus susceptible to the spills and stains of life. I made some braided Challah bread to take to dinner tonight and I am cooking up some homemade macaroni and cheese. It is Thanksgiving in Canada and I am going to a big potluck! I know there will be lots of gravy and then whipped cream for pie! I hope you all have a wonderful day, and since this post is my participation in the World Blog Hop! 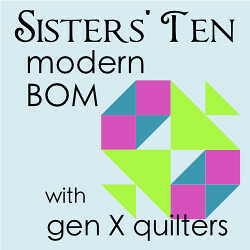 I want to direct you to two of my favorite bloggers in the blogging quilt world. ...who is participating in another blog hop today! ...whose work I always enjoy. I realized after writing this post that the point of the Blog Hop is to answer certain questions about the creative process, which I hope that I have addressed here but I am always glad to explore more. I do want to share that one of the main things that I feel sets me apart from most other blogging quilters is that I live off the grid, and often sew and craft with minimal electricity. This means I do not have a fancy iron and sometimes when it is raining I content myself with cutting out pieces rather than running the machine. In my next post I'd like to share my recipe for macaroni and cheese, and the top to my denim nine-patch quilt which is now finished! Thanks for visiting! I invite you to join me in reconnecting with food, the Earth, and the things we use.